By: Ardonna Bucher, our (a ficiona'do) on this subject. Ardonna's P.O. Spatula Footed DRAGON & LOTUS IC Shaped Bowl. Spatula Footed/Ice Cream Shape - Peach Opal: This shape really shows off the pattern to its best advantage. The three spatula feet come right off the collar base. The edge has the usual picots all around. Sometimes two or three of those little picots run together. This doesn't bother me that much because it is in the manufacturing. The sides usually curve and come straight up. The diameter is 7 ¾”, the height is 3”. There are three mold lines. The exterior is plain. Starting in the bottom of the bowl there are four petals. Each petal has three curved lines forming a leaf on each side. In each petal, a twelve petaled flower on a stem with two leaves. Two lines dissect the bottom between the petals. The lines have three concentric circles on the ends and hash marks around the whole line. Around that design a raised line goes up and down. Sometimes this is symmetrical and sometimes it asymmetrical. Above that, four lotus and four dragons are spaced intermittently around the sides. There is a floating lotus with the root between each of the dragon and lotus. Each lotus blossom is encircled with its stem. The tops have a squared off protrusion with hash marks. The stem in the lotus blossom doesn't touch the floating lotus. The root of the floating lotus encircles the dragon. Did Mr. Fenton do this to signify the lotus as the giver of life? The spatula footed bowls and plates have a distinction from the collar base pieces. On every spatula footed piece I've seen, there are always two dragons with five toes on one foot. Find the dragon with five toes on the left foot. Now go to your right and that dragon will have five toes on his right foot. These could be called the Imperial bowls. The five toes dragon is the Imperial Dragon. In my experience, I have yet to find a spatula footed bowl that doesn't have two dragons with five toes. Back to the Peach Opal ice cream shape spatula footed Dragon and Lotus bowl. You're probably thinking sooooo what's so special about an ice cream shape spatula footed Dragon and Lotus bowl? I thought the same thing when Diane Fry asked if I had one. She said, “Did you know these are scarce”? I had no idea! When you already have that shape, you don't pay much attention. I got out Mordini's price guides and was surprised to find that from 1984-2005, only 9 had sold in twenty years and these did not all designate the ice cream shape. So if you're one of the lucky ones who has that shape and color, you are very fortunate indeed! Spatula Footed/High Ruffled Shape - Amethyst: This shape stands taller than the regular ruffled bowl. It's 3 ½” tall and the diameter is 7 ½”. In most auction brochures this is usually the one listed as a spatula footed bowl. It would be nice if they could give a little more information. This particular example shown has special significance. After I started collecting the Dragon and Lotus pattern, the Frys asked if I would be interested in buying this bowl. Then they told me the story surrounding it. The San Diego Club had just been organized in June 1985. The Club decided they should choose a motto and an emblem. Anyone in the Club could submit their choice and then the members would vote. Dean just happened to pick this bowl for the dragon he drew. You guessed it! He had a fifty-fifty chance of picking the dragon with five toes and he did. 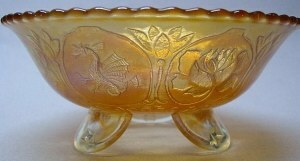 The bowl pictured here is that same bowl Dean Fry used to draw the emblem for the San Diego County Carnival Glass Club. You see, on every spatula footed bowl or plate, two dragons have five toes on one foot. These two dragons are significant. The Chinese culture designates them as the Imperial Dragon, used only by Royalty. Severe punishment resulted if used by the peasants. We can designate these as Imperial bowls. If you are a member and receive the San Diego Newsletter, you'll see the winners of the contest on the cover. So now you can see why this bowl is special to me. I joined the Club six months after it began. 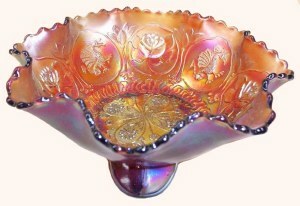 Ruffled Collar Base Shape - Amethyst Opal: The Fenton Art Glass Company began producing opalescent colors as early as 1908. Mr. Frank Fenton graciously answered many questions about the Dragon and Lotus pattern for me. He told me the opalescent colors were produced early. In several books they show pieces in vaseline opal and amethyst opal. This could account for the many different opalescent colors of the Dragon and Lotus pattern. In earlier writings it's been stated that amethyst opal is rare, but according to the definition of rare, I think scarce is more accurate. This ruffled collar base bowl is 2 ½” tall and 8 ½” across. The opalescent edge has a lavender tinge with a dark purple color in between the picots. In all of the bowls I've seen, the collar base is light lavender color. They seem to always come in the ruffled shape with pretty iridescence. Not many sell at auction. From 1984-2005 there have been 16 recorded sales. One of these was designated as being lavender opal. The average price was $1,014. Collar Base Plate - Marigold: True, flat plates in the Dragon and Lotus pattern can be considered scarce to rare in any color. Among the many many bowls in the pattern, there are very few plates comparatively in any color. Why? For many years marigold, blue and peach opal were the only known colors. In the last eight years, five different plates have surfaced. First, the spatual footed amethyst, then the lime green opal collar base, next a marigold spatula footed, finally, a green plate showed and last the amethyst collar base plate. 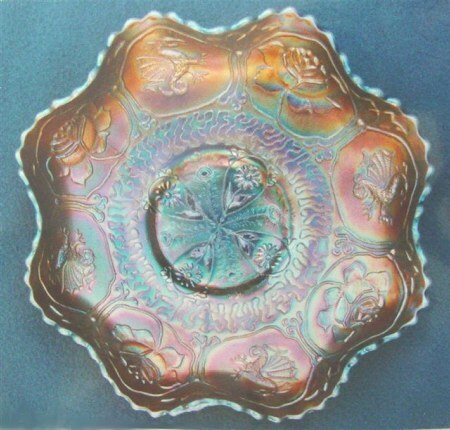 This marigold collar base plate, like most Fenton plates is very flat and has great iridescence. The plate stands 1 ¾” off the table and is 9” across. Dr. Chris Reynolds had this in his collection for quite a few years. I used to buy carnival glass from a man in Pennsylvania. One night we were talking on the phone and I mentioned buying Dr. Reynolds' Dragon and Lotus collection. He asked if I had a marigold plate in the collection. I told him yes, a very pretty one. He told me that was one plate he had always regretted selling. He sold it to Christ for $85. What a bargain! 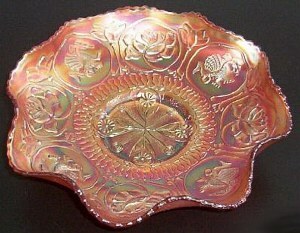 The marigold collar base plate doesn't sell too often at auction. According to Mordini's Auction guide, only 19 marigold examples have sold in 22 years! It's a nice addition to any collection! The highest price paid thus far was in 1995, when one sold for $3300. Ice Cream Shape, Spatula Footed Bowl - White: Why is white such a rare color in the Dragon and Lotus pattern? Do you have one? This white bowl was also in Chris Reynolds' collection. It's a nice frosty white and does have some iridescence. It measures 7 ¾” across and is 3” tall. George Loescher told me he found this bowl in the Midwest and sold it to Chris. One time in Quartzsite, AZ, at a big swap meet, I met a woman who told me she had sold a white Dragon and Lotus. She owned an antique store in Colorado Springs. I have wondered whether that could be the bowl George found? Thinking I had the only known white bowl in this pattern, I was surprised to read that Bob Bishop had the only known white example. 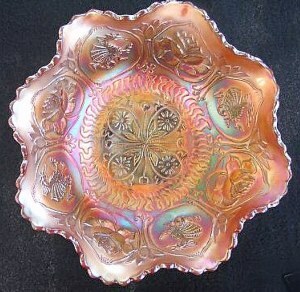 After some research, I learned that Bob Bishop had a ruffled collar base bowl with nice iridescence. 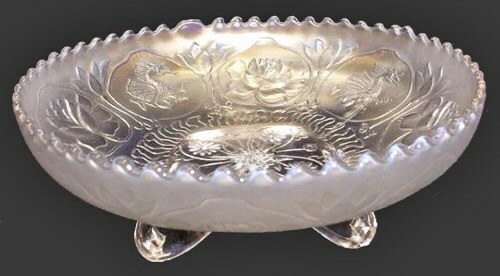 To my knowledge, these are the only white Dragon and Lotus bowls. Spatula Footed Nutbowl - Marigold: This is one of those rarities most consider a “so-what”. If you're a nutbowl or Dragon and Lotus collector you would probably think otherwise. Chris Reynolds had a marigold collar base deep bowl, blue collar base deep bowl and a blue spatula footed bowl in his collection. I had never seen these before. Chris told me these are nutbowls. 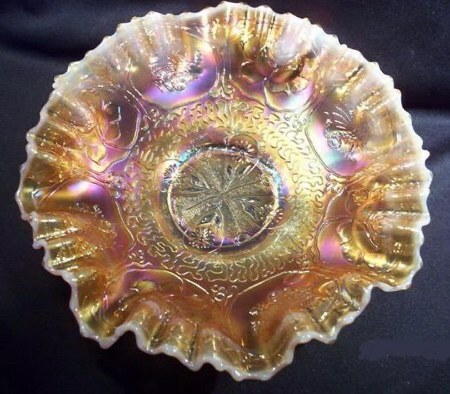 In Sherman Hand's book on carnival glass he lists the nutbowls as the rarest shape in the Dragon and Lotus pattern. The nutbowl has only recently been listed in books. I took the nutbowls to the San Diego Club meeting to share and ask if they ever came across this shape to let me know. It paid off. One day Fred Roque called from San Francisco. He was at a show and had found a green spatula footed nutbowl. With his help, I added a green example to the previous list of colors. While visiting in Bakersfield, CA, I found another green spatula footed nutbowl. These are the only two I`ve seen. While doing a program at ICGA convention in 1998, I remarked that I had never seen a spatula footed marigold nutbowl. About two weeks later a letter and picture of one arrived from the Mizelle's. They had located it while antiquing in Texas. Fred Roque called to tell me he had contacted a man who owned an amethyst spatula footed nutbowl and an amethyst collar base nutbowl. The spatula footed bowl was purchased, but the man would not sell the other one. Last year I finally found a marigold spatula footed nutbowl on e-bay. That makes marigold in collar base and spatula footed; blue collar base and spatula footed; amethyst spatula footed with a collar base known; and green in spatula footed only. Wonder if any other colors were made? A red one would be nice! Low Ruffled Collar Base Bowl - Marigold: What can I say? This must have been one of Fenton's most popular sellers! 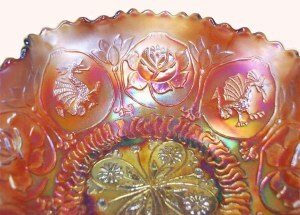 This Dragon and Lotus bowl in this shape and color is probably the most abundant and available piece in carnival glass. Any collector can own a beautiful and unique bowl in this pattern without breaking your budget. The unique thing about this pattern is the fact that it is known on only one other pattern~~Dragon and Strawberry. 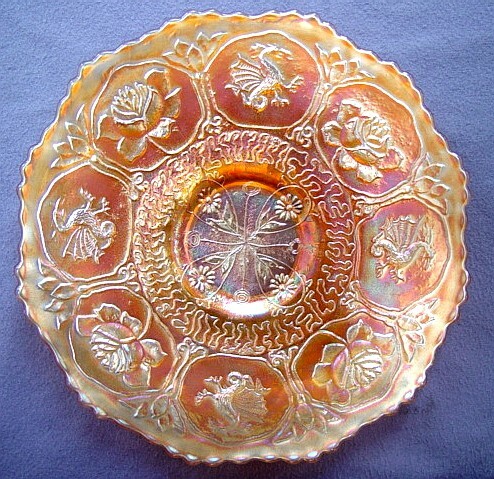 Fenton is the only company to have produced a dragon as part of a pattern. Perhaps this is the reason it has always been such a popular item with carnival glass collectors? These marigold bowls are really a bargain when compared to many other patterns. They can range from $25 - $150 - hardly ever more than that. Another reason for collecting Dragon and Lotus is the wide range of colors and shapes to be found. 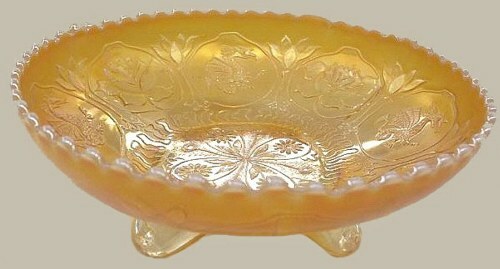 Collar Base 3 -1 Edge Bowl - Peach Opal: This bowl can be found without much trouble. I used to call this three in one, but in reality, there are three tight ruffles and then one large; hence three and one. This can be confused with the candy ribbon edge. In earlier issues of price guides they listed these as candy ribbon edge. I'm sure it must have been an oversight. I've never seen a candy ribbon edge or pie crust edge in the Dragon and lotus pattern. Fenton's peach opal is very different from Dugan's. Fenton usually has very little opal. Sometimes it goes down about a quarter of an inch and will meander even further down. Other times it's just barely visible on the tips. These are found in very low bowls. They could qualify for a plate if they weren't ruffled. 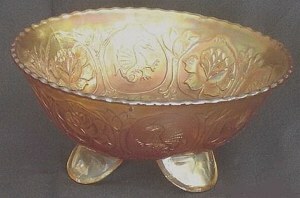 This bowl is 8 ¾” across and stands about 2 ½”. The collar base is 3 ¼”. The only opalescent colors I've seen with this edge treatment are peach opal and vaseline opal. They are also found in marigold, amethyst, green and blue. This story is on me! Some of you may relate to this. When Joyce Seale had her last auction at HOACGA, there was a pretty peach opal three and one edge collar base bowl included. I couldn't remember whether I had one. You're right! I bid on it. In fact, I think I set a new record price for this bowl! To my dismay, when I got home, I not only had one, but two of these bowls. It was an expensive lesson. Now, I always carry my list. According to Mordini's auction price guide, 31 peach opal three and one edge bowls have sold over the past 22 years. Psalm 103 is a call to praise God for His love and compassion. David wrote it to remind the people not to forget God and what He has done. Forgetting God is a characteristic of the faithless backslider. Material prosperity often leads to this sin of forgetting.